"The Olympia Hippodrome and Circus - not of Paris - visited Yeovil on Tuesday and met with a sad misfortune. The day was boisterous, and the procession through the streets was shorn of much of its anticipated splendour. The large marquee was fixed in a field, and in the afternoon there was a good attendance of children and others. The heavy rain made it very uncomfortable, and suddenly a tremendous gust of wind lifted the tent and poles from the ground and then the whole collapsed. Fortunately the marquee had been lashed to heavy caravans, and was not at once brought bodily to the ground. However great consternation prevailed, and the attendants, in order to allow the occupants to escape quickly, cut holes in the canvas, and many of the visitors crawled out. It was reported that two children were injured, but if so they soon made their way home. None of the animals, performers or attendants were hurt. The performance had not commenced when the accident happened, and the circus was not full, or more serious results might have occurred. The damage is estimated at £130 (about £60,000 at today's value)." "April 26: The Olympian circus arrived here today. The visit proved rather unfortunate; during the whole of the morning it rained incessantly thus spoiling the effect of the procession and in the afternoon the wind became so violent that it blew the tent down just as the audience had taken their seats. Of course they were compelled to leave without witnessing any part of the performance. Fortunately there was no personal injury but considerable damage was done to the property of the O[lympian] company. The latter however have been tonight somewhat compensated for their losses by being largely attended in another tent." 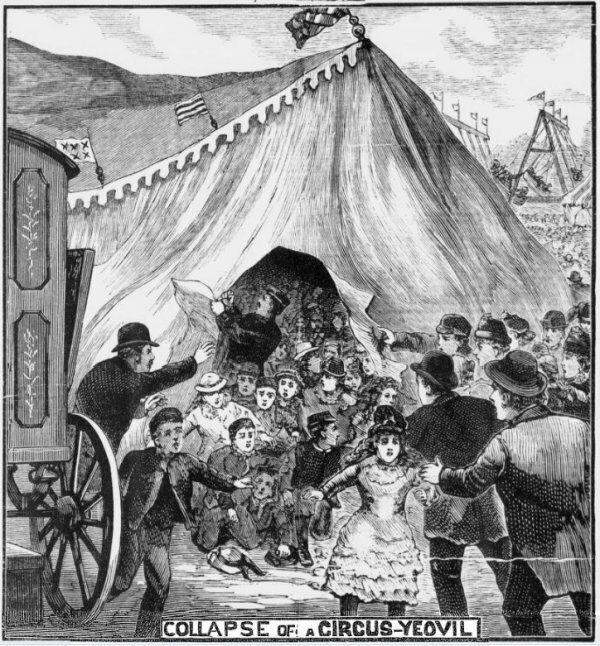 This illustration from the 'Illustrated Police News' of 7 May 1887 shows the panic as people escape from the collapsing circus tent through a hole cut into the canvas.